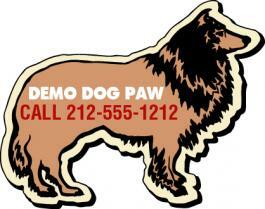 This custom 2.62x 3.37 dog shape magnet – 20 MIL adds an impact to your business and brand name. With high quality full color printing, strong magnetic material and budget friendly costs, nothing can go wrong about your campaign. Indulging and investing in this magnet is perfect way of raising awareness about pet care and your animal care business. Vets, dog breeders, dog trainers or boarders, pet supplies, pet groomers and others can always avail discount by bulk ordering this magnet. Request a quote to know price benefits on bulk orders of these customized 2.62x3.37 dog shape magnet – 20 MIL. Imprint area – 0.5" x 1.5".